Last summer, the Winegars stayed busy—they did a lot of travelling, visiting scenic locations in the southwest and soaking in the vibrant skies and the serenity of desert flatlands. Both artists, Jim and Linda thought it would be inspiring, and they were looking forward to seeing old friends scattered around the country. They made stops at tourist attractions and art festivals. They saw the Grand Canyon, Tucson and parts of Mexico. After months of bookkeeping, they enjoyed the freedom; having spent most of early 2018 packing up their craft shop and gallery, Artbeat, and returning inventory to the contributing artists. In a corner building on High Street, Artbeat used to contain hundreds of handmade artifacts—jewelry, pottery, paintings and more. The Winegars collected pieces from around 80 local artists, displaying them in the gallery and entering them for display in larger art festivals in nearby Pittsburgh. But after five years in operation, Jim Winegar said the shop was no longer feasible to maintain. “The demand of operating a store, regular hours, overhead and it all, adds up to a certain number that if you don’t have people coming into the store and selling your wares, it doesn’t make sense to maintain,” said Winegar. So, they packed up the art and vacated the building. The Winegars don’t travel through Waynesburg much these days. And they aren’t the only ones. In less than a year, more than five small businesses in Waynesburg have permanently closed their doors. The reasons vary—financial struggles, overhead costs, better job opportunities elsewhere, and in one case, a devastating fire. But it was consensus among the owners that the plight of the rural small business in Waynesburg made it harder to live up to these challenges. Another such owner was Drew Johnson, who closed two start-ups in the last year. Johnson started Waynesburg Coffee Company with his wife, Laura, in August 2017. 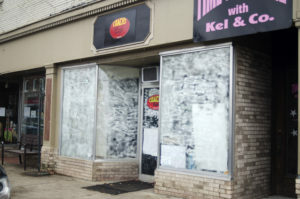 The shop, which sold specialty coffee drinks, sandwiches and quirky items like lemonade and hot dogs, was a faith- and family-oriented experiment aimed at bringing the community together, Johnson told The Yellow Jacket last year. Then in February, the Johnsons purchased another Waynesburg restaurant, Coach’s Café. Coach’s, formerly owned by Matt Tedrow, had opened its doors around the same time as Waynesburg Coffee Company, but Tedrow decided to move on. The Johnsons tried to operate both shops for awhile, but by the end of April, Waynesburg Coffee Company closed and the Johnsons worked solely at the Coach’s Café location. While the move seemed like a strategic way to reduce overhead, it wasn’t enough. Coach’s Café closed in August of the same year. In the end, Johnson said they just weren’t prepared to operate in the small-town environment. Eventually, he reached the point where he could no longer afford to reorder supplies. Now, Johnson is working as a sales representative at the local Verizon store; his coffee shop sits empty, the hours of operation sign still dangling in the window. In rural Greene County, Waynesburg contains much of the area’s businesses and governmental functions: the court house, banks, fast food and grocery stores all reside here. 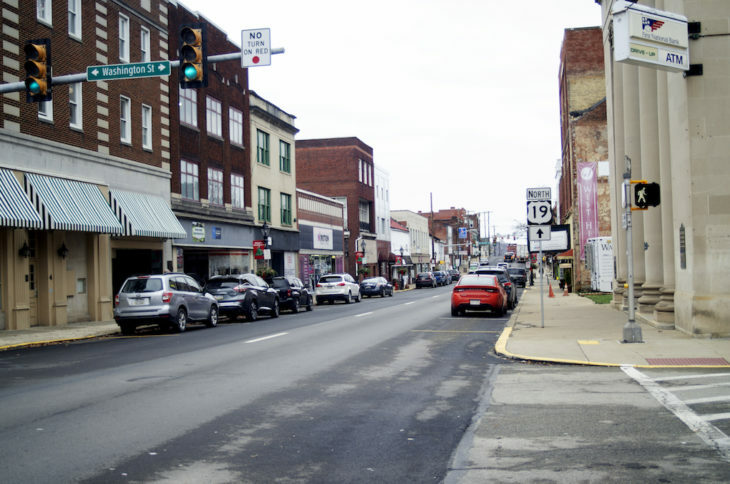 Still, it is not a city by any means: Waynesburg’s population hovers below 4,000 people, according to the U.S. Census Bureau, and has steadily declined in recent years. Really, the town is a microcosm of an entire county that is struggling. Greene County is the second-poorest in Pennsylvania, with a poverty rate of 15.3 percent. Much of the population is reliant on the coal industry, and has been for generations. According to the Pennsylvania Coal Alliance, coal provided more than 7,000 jobs in Greene and Washington Counties. But in recent years, as the coal industry becomes more unstable, the rest of the economy has also experienced hardship. Hundreds of workers have been let go from different mining companies, and many Waynesburg business owners think it has had a direct impact on their sales. “I’d put it on a couple different things: the 700-plus miners losing their jobs, two of the mines closing on either side of town,” Winegar said. Not all businesses in Waynesburg are struggling. Some have been around for decades, Winegar said: Mickey’s Mens’ Store, 5 Kidz Kandy and the Fashion Shoppe, for example. But every store has experienced the challenge. Lauren McMurray Stauffer owns and operates Ruff Creek Crafts, a cozy antique shop that is closing after five years. Stauffer’s business is closing due to her retirement, but she said she has not been spared the difficulties. Small towns across the United States have experienced severe economic downturn. In February 2018, the U.S. Partnership of Mobility and Poverty released a report mapping the economic and social mobility of residents all over the U.S., with an accompanying paper explaining that “zip codes matter” and residents of small communities are often trapped in bubbles of no opportunity. Major news outlets like Forbes and The Chronicle of Higher Education have also reported that in the last 10-15 years, shrinking populations in small towns, in addition to falling incomes and lower education levels, contribute to an overall decline. Opening Waynesburg Coffee Company and Coach’s Café here last year, Johnson feels like he was doomed from the beginning. Johnson knew there were going to be challenges operating a small business in Waynesburg. But, originally from Nashville, Tennessee, he was charmed by the close-knit community of the small town his wife grew up in. He dedicated himself to helping that community thrive: only using local ingredients and situating the business on High Street. The odds were stacked against him, he said. During the summer months, when university students were away, the customer base was essentially nonexistent. Johnson also thinks parking on High Street and the constant big-rig trucks rumbling through town were a negative factor. He said Coach’s Café just wasn’t a unique enough idea to draw people from outside of Waynesburg, to attract the volume necessary to support the expenses. Johnson fears the community he loved is becoming more disengaged, making the cycle even worse. He said people don’t truly realize the plight of a small business owner in a small town like Waynesburg. Winegar, also a founding member of the Waynesburg Merchant’s Guild, said it has been disheartening watching business after business fade away from the fabric of the community. The Merchant’s Guild plans collaborations and initiatives among the different businesses, but now the group members are dwindling. With businesses struggling or closing outright, some of the collaborative events that used to categorize Waynesburg have ceased to exist, like the annual chili-cook off or the annual cookie caper contest. Even the Holiday Open House, a Christmas celebration featuring carriage rides, Santa Claus and specials from the various High Street shops, will be comparatively bland, Winegar predicts. It isn’t just about the economy, Winegar said. The community itself is falling apart. The Artbeat building now houses the Republican Party of Greene County. Antique furniture is being hauled out of Ruff Creek Crafts as the store liquidates. Coach’s Café is still vacant. Winegar said the Merchants Guild he worked so hard to establish is now close to dormancy: meetings are scarce and unorganized. He doesn’t attend much anymore, and he knows many other regulars have also dropped out. But he said misses having the shop. He misses coming into town every day, interacting with local vendors and facilitating a strong art scene. Working in his private studio just isn’t the same. “We really do miss the state of being in town, interacting with people,” he said. Sometimes, they would “dabble” in a craft themselves. It all contributed to a more wholesome experience, Winegar said. Johnson, too, misses running Coach’s. He is enjoying the time off, for now: he said it’s a relief to not be the one in charge for once. Today, he is “burned out,” but tomorrow, he said he’ll eventually start anew. “Almost immediately, I always have the idea wheel rolling,” he said.